Once upon a time I was bored .Very bored.Just surfing the net for buying more stuff ,which I may or may not need.Of being unable to leave my 9 months old baby ,to the local untrained nanny to go for conferences and workshops.Missing the vibrant atmosphere of academic discussion at my earlier institutes ,I was destined to grow mold.Until inspiration struck.Why not write about what I do best ,professionally and personally .It will help others and help me . That’s when I thought of starting a blog.Writing books came later after 2 and a half years. When I was deciding on my blog audience and niche I knew I wanted to talk to my girlfriends ,the girl gang who hangs out together discussing everything under the sun. That’s whom I know .That’s whom I can identify with. I am a chatterbox so having very few people to talk to ,made me write more. What do I know professionally? Here I had a wide range to choose from.But I was passionate about sharing health and lifestyle information which affects women and children.Living healthy and feeling good is a journey and is not a single point destination. That’s why I had the health in my blog name. Personally, I have always felt people are silly about money.They know they need money.they know they want money.But they feel it’s bad to earn more and are stuck on the hamster wheel.Money is energy.It’s God’s way of ensuring you can get what you want.But what you want is in your hands.God blesses our actions and thoughts but you are responsible for them.Sounds confusing?Not really.It’s all about perspective. If you want to live well , happily .learn something which people value and willhappily.Otherwise it’s a struggle.Life lessons from my mom.That stuck in my head.I have seen too many times how cash crunch can take away your peace of mind.That’s a boat I never ever want to ride. The reason behind the wealth part of my name.I want to help people get rid of the fear of earning well.Of self-sabotaging their way to financial freedom.I am on a journey and I want as many people as possible to be there with me. I wanted to help women and other moms cope with living healthy. I wanted to help them find their goals in life. I wanted to help myself, by writing about my fears, worries, and struggles and find a way to solve them.That way more people could be helped. I wanted to do a social experiment.I wanted to try the hacks suggested, in the 4 hour work week.Now my professional obligations make the 4-hour thing impossible.But the concept holds good. If you are not afraid to learn, are moderately net savvy and love story-telling, you can start to earn online without selling snake oil or doing something icky. I wanted to learn how people can earn online .If you are educated it should help right? I have always felt knowledge and education is looked at in an upside down way.Its important that you study hard and get your degrees .What is even more important, is the education should help you become independent .If your education doesn’t help you become employable or independent in financial ways, the rest is going to be difficult. I am employed full-time as a medical teacher and ENT surgeon .My dream of setting up a blog to learn the ropes is well on its way .I would like to support education of girl child, ensure clean air water and basic education for all and support our army wives and children.I know it’s sounding pretty impossible with this itty bitty blog . It’s a tall order and when I told my hubby, he looked a little shocked with my plans for this little blog .But whats life without hard-to-get goals. If I can help even one person rewire their thinking and try more, I would have met my daily goal . During revisions of my study materials I focus on the big parts .Then break them down into bite sized parts .Then do them one after another .Till you have done all.Simple . Everything in life has happened because of my continuing conversation with God .If you can look inside yourself and find your answers, you will never falter.You may make mistakes, will probably do, but the mistakes are also a part of the bigger plan. What you do you do ,what happens is destiny . This year I have received the Work At Home Bundle from the Ultimate bundles people.Its ready to get launched soon.I am going through it and making notes.If you do buy the bundle, you can access my quick summaries of the material and choose to focus early on the important areas.This bundle couldn’t have come at a better time. I have felt moms need a way to be independent even when they take care of children.Children are our future, they will be like the influence they have.Quality and quantity both are important.What we need to work on is more Government and corporate help, to make moms working schedules flexible. 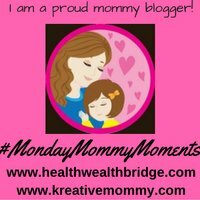 W riting this for #MondayMommyMoments this week. Actually I also wanted to help myself in a way! Engaging with such an amazing community and meeting the best of people has been good! What an inspiring post! I love that you started blogging in order to help other mums. Being a mum is hard and it’s helpful reading the experiences of others. Wow! Such a lovely and inspiring post to read. You’re one of those great people who know how to manage life and passion with their skills. Great reasons to know why you started this blog, and moms out there will definitely start thinking what they really wanna do personally aside from working for living. Keep up the great work! Oh I loved reading this, Love your aspirations! Loved what you said here, “But what you want is in your hands.God blesses our actions and thoughts but you are responsible for them.” so true and I agree! I think it’s great you started a mom blog to help other Moms out there. I blog about mental health and bullying in the hope that talking about the things that I deal with and have been through will help others. Why we blog is important . Reading your post is always a rejuvenation for me, Amrita. I learn so many new things and I admire your enthusiasm. You don’t fear achieving more and intensely believe in God. This is what connects me with you. Interesting & it so very much comes in same terms as to why I too started my Mommy blog! Its nice to be in this community & share & learn ample ways! Great post. Thoroughly enjoyed reading it. It’s amazing how you are balancing your work life with your passion for writing. Keep up the great work! You’re correct, most people don’t know how to handle their money and need all the guidance they can get! I agree Amrita..education and financial independence is very important and if we can help other moms through our blogs that’s the best thing. We share our experiences and we learn from each other. I admire your ambition. I’ve often wondered how you are able to do it all. But it’s not too hard when you are doing what you love.